By default, pre-created profiles aren't displayed in the People section of the app. But if you'd like to have the entire attendee list visible even before the users log into the app, you can set this up in Settings > Profiles section on your dashboard. Profile Visibility enables the option of showing pre-created profiles in the People section of the app before they are claimed. Allows you to control the information attendees provide in their profiles by enabling/disabling default profile fields. 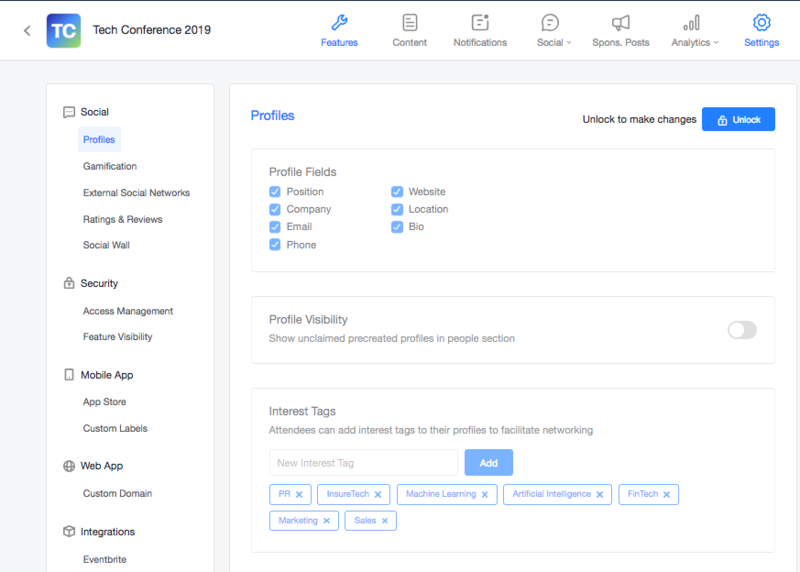 Gives you the ability to create interest tags that attendees can associate with their in-app profiles to show their interests and find matching ones amid other attendees. Please Note: profile fields and interest tags are only available for branded apps. Events published to the Attendify app don't have these settings.